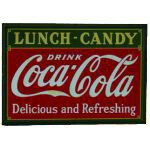 This vintage Continental Oil Company $100 reward sign is an old, porcelain gas pump sign. 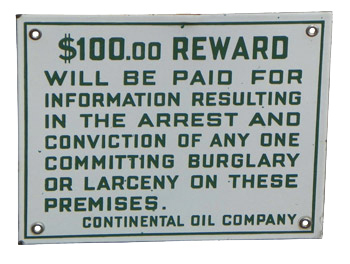 The sign reads: “$100.00 Reward / Will be paid for information resulting in the arrest and conviction of any one committing burglary or larceny on these premises. / Continental Oil Company.” The background of the sign is white, and the lettering is dark green in all capital letters. There are four holes for hanging, each reinforced with metal grommets.